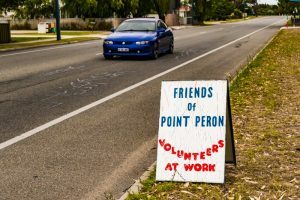 Friends of Point Peron (FPP) was founded by James Mumme in 2006 in response to letters in local Rockingham papers saying that the Cape was full of rubbish and weeds and needed a marina. The initial idea was for people to adopt patches of bush and look after them in their own time. For six years 14 families pulled out Geraldton carnation weed from their patches, removed rubbish and planted over 6,000 seedlings with good support from Parks and Wildlife who funded planting and a pump and trailer. An elderly couple could often be found carrying two litre bottles of water to their seedlings. They even made a sign – Bert and Belle’s Patch. Once a fortnight we’d meet as a group to work on one family’s patch. Today only two adoptive families continue tidying up their plots once a year – natural regrowth has complemented replantings and flourished in the absence of competing weeds. Then work stopped as key members became involved in attempting to save the Park from the proposed Mangles Bay Marina. We researched, lobbied and wrote submissions to various levels of government losing every battle. Ultimately in mid 2016 60 of us appeared in person before the WA Planning Commission. After those hearings hopes began to revive because planning issues looked like they might sink the project which in the end they did, though not without huge work into the environmental issues. FPP began tackling carnation weeds again. This year with great support from Parks and Wildlife we have also been tackling woody weeds – mainly Brazilian peppers and buckthorns – which have gone feral during the time the MBM was hanging over the Park. Many of the threats to the TECs at Lake RIchmond are understood to be originating across the road in the Cape Peron Reserve. So far this year over 130 volunteers have taken part in 28 clean ups to deal with thousands of weeds. The City of Rockingham have also come to the party in offering to remove the trees. Excellent support has also come from Conservation Volunteers Australia, Kolbe College Bush Rangers and Hands Off Point Peron.In this post MBM era challenges still remain. Elements in the local community are still eyeing the Cape for development. Bush Forever sites are not yet well enough valued or protected to ensure they are beyond bulldozing. A recent letter to the paper talked about the ‘scrub’ being perfect for a caravan park ! To resist those challenges FPP is demonstrating to the community and to decision-makers that people do care about the Park and are willing to get their hands dirty and their shirts sweaty. We are also supporting Parks and Wildlife’s work and helping to prepare for the eventual Coastal Park of the South (or whatever it’ll be called). to obtain funding to plant 2000 seedlings next winter. to engage the community in putting forward ideas for improving the Park so that it is inviting, educational and enjoyable. to support DBCA’s planning processes for enhancing the Park’s attractions. Work has focussed on the eastern part of the Park from Safety Bay Road as far as Shoalwater Bay and the Causeway. 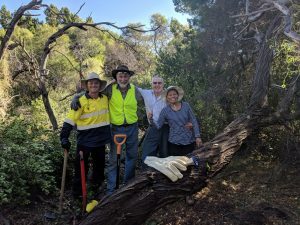 Our 125 volunteers include local supporters who register with DBCA, volunteers with Conservation Volunteers Australia and Kolbe College Bush Rangers. We are not presently having formal meeting times due to the need to prioritise preventing the woody weeds from setting seed. Instead our Clean Up times are advertised on Events WA and by email.